Gang rapes, limbs amputated with carpenter’s saws and no anesthetic, partisans drowning their own bawling babies, prisoners of war being stabbed and brained to death, suicides dangling from village trees—the revised edition of the Nobel Prize-winning writer Svetlana Alexievich’s landmark book about the experiences of Soviet women during World War II, newly translated as The Unwomanly Face Of War, is as much an oratorio of horror as an oral history. It begins, more or less, with a cacophony of nameless, faceless voices: pages and pages of out-of-context interview material, the worst of the worst, censored from the original Soviet edition or cut by Alexievich herself. Who are these people? Are they interviewed elsewhere in the book? Did she make them up as some kind of rhetorical device? Before this comes a very brief history of women in the military—from ancient Greece to World War II—and a few diary entries. But it’s the stomach-churning danse macabre of anonymous story fragments that makes the point. Then, the first proper chapter, a morbid duet: two long interviews with female snipers. By the time The Unwomanly Face Of War gets to the place where one might expect an oral history to begin—that is, a chapter where dozens of interviewees recall enlisting in the Soviet war effort in paragraph-sized chunks—the reader has already been led deep into the dark regions of the war, its psychological and social aftermath, and the Soviet psyche. It can be hard for someone not born in the former Eastern Bloc to grasp the extent to which the memory of World War II seeped into every aspect of Soviet and post-Soviet life, or to fully understand the toxic effects of the heroic myth of capital-V Victory, which put the realities and unresolved traumas of wartime in a no-zone, akin to the irradiated woodland around Chernobyl. Just about every family has stories that are only told once, places where the old people wouldn’t go for reasons they never wanted to give, tightly wound behaviors and anxieties that the generation of war survivors passed on to their children. Alexievich, who is from Belarus but writes exclusively in Russian, goes straight into these off-limits areas, not content to merely cast light from a distance. She might be called a historian averse to statistics, records, and documents; this is understandable, as anyone from the former USSR can tell you that all three can be faked. Originally published in 1985 and revised in 2004, The Unwomanly Face Of War is the book that first made her name. In relating what Russians still call the Great Patriotic War from the perspective of women—about 800,000 of whom served in the Red Army on the Eastern Front—it dredges up repressed memories and pointedly refuses what most histories take at face value. It resists the plural in favor of an orchestration of first-person singulars—women who were soldiers, partisans, engineers, nurses, or resistance fighters, or lived through the war as civilians or children, interviewed in the late 1970s to early 1980s. Even when their names are withheld, that first-person “I” burns in a way that numbers can’t. But one would be mistaken to read this as pure journalism. In fact, it’s pure literary technique. Alexievich assembles her works of documentary literature (Voices From Chernobyl, Secondhand Time: The Last Of The Soviets) like a composer, orchestrating material from thousands of hours of tape-recorded interviews; her sense of structure is idiosyncratic, lyrical, flowing, extremely readable. Every chapter is a movement, every interviewee an instrument. 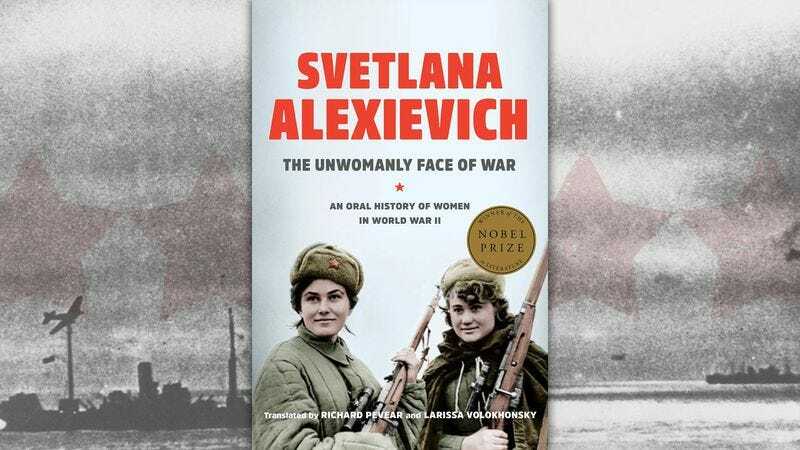 The Unwomanly Face Of War is the first translation of the revised edition of Alexievich’s book, and it bears two of the biggest names in Russian translation: Richard Pevear and Larissa Volokhonsky, who are known for their renderings of Dostoevsky and Tolstoy. As is sometimes the case with the husband-and-wife duo’s work, it prioritizes unobtrusiveness and technical accuracy over reader experience; those who aren’t at least somewhat familiar with Russian grammar may feel left out in a few spots. (Another quibble: Pevear and Volokhonsky transliterate all place names from Russian, e.g., “Zhitomir” for the Ukrainian city of Zhytomyr.) But some awkwardness and stiffness doesn’t detract from the structural musicality that is both Alexievich’s major talent and the sticking point for her critics. Much as the Russian language perceives blue as two different primary colors, it splits “truth” into two distinct concepts: pravda, which could be summed up as a purely factual truth, and istina, which refers to a deeper, more philosophical meaning. 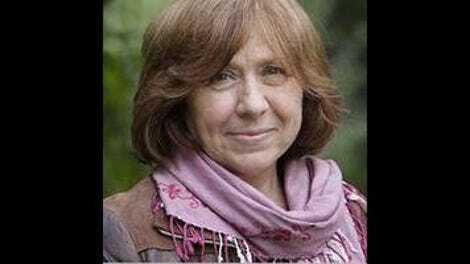 The former is that which is true; the latter is that which is “the truth.” Alexievich—a pacifist, a journalist-turned-anti-journalist, and a skeptic of the Soviet and post-Soviet status quo who plucks passages from interviews and edits them together into stories—has very little interest in pravda. It’s an istina that she’s trying to compose and express. She is out to dispel the mythology of World War II. Spotless heroism is an easy target, but she goes after the ones that were really essential to the Soviet Union’s postwar identity, including the notion of Nazism as a seductive adversary (the German occupation forces come across worse here than in most Soviet war movies) and of a sunshine period of demobilization and rebuilding. Her voices speak instead of nightmares, rejection, and the brutal and punishing reflexes that crept into everyday life in the years that followed—how commuters on a trolley car could beat a pickpocket unconscious and ditch him on the side of the road without thinking twice about it. But they speak also of the strangeness of being a teenager at the front line—of having one’s first kiss with a corpse in a ditch, with the other young medics watching. A reader picks up on the subjects that seem to really draw Alexievich’s attention: abject horror, amputation, regret, the way clothes felt or were worn, hopeless battlefront crushes, suicide. (The last one is something of a career-long obsession; Alexievich devoted a whole book to the subject, 1994’s Enchanted By Death.) She is fascinated by the delicate and the grotesque, and like any artist, she uses her fascinations as creative material, shaping the interviews into a vision with moral clarity. It’s a vision of war as an engine of countless individual tragedies and traumas, its survivors haunted by what they saw and did, and obsessed by what could have been. Perhaps just as importantly, it’s a vision that refuses to abide by the internalized logic of war—to think in tactics, statistics, and outcomes, or to draw a conclusion that dehumanizes and justifies the means. Purchase The Unwomanly Face Of War here, which helps support The A.V. Club.